we want to elevate great brands who are making a profit and a difference. while we could shun all of our possessions and live in a tent off the grid forever, we probably shouldn’t. if we are going to consume, let's do it consciously and find joy from each bite we take and each good we purchase. we only include brands we've tried ourselves, so we can personally vouch for their awesomeness. our diet is a powerful way to influence our impact on the environment. Grass-fed, pasture-raised buffalo, in the Great Plains, restoring them to their historic home. Need we say more? This brand is also a favorite because of its treatment of its employees and its humane slaughter practices, not to mention its antibiotic and pesticide-free. Niman Ranch processes and distributes antibiotic & hormone-free products from small family farms and achieved Certified Humane status in 2016. One small caveat to this brand-- their beef is not 100% grass-fed (finished on grain), and as a result does not claim to be organic. 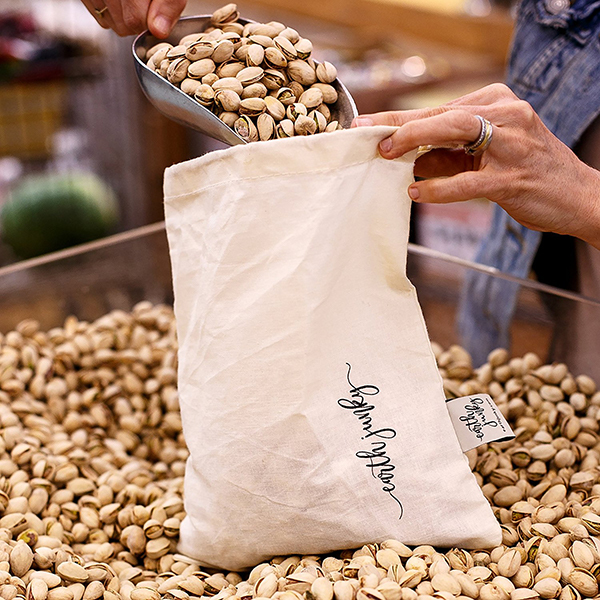 Even so, this brand is significantly preferable option to factory farm products and is widely available across the U.S.
100% organic cotton muslin bags so you never have to use plastic produce bags again! These also work great for bulk grocery items, like nuts, trail mix, grains, or even dark chocolate covered almonds. They are machine-washable, and have the weight on the tag for easy adjustment at the grocery counter. If you go to the grocery store 1 x week, and use 5 bags on average each visit, you are eliminating 260 plastic bags each year, or 7,800 plastic bags over 30 years. Game changer. And you're buying from a small family business. Win! Use promo code "ALTITUDE" on Amazon or EarthJunky website for 15% off up to 2 units through April 15, 2018! Klean Kanteen® is a family-owned company with stainless steel, BPA-free, reusable water bottles and mugs as a non-toxic solution to single-use plastic water bottles. They are a certified B Corporation, and the insulation on these products is EFFECTIVE AF. Drinks stay cold up to 100 hours and hot for up to 30 hours. Finally! A non-toxic alternative to plastic storage bags that you can freeze, sous vide, microwave, wash in the dishwasher, and store food in the fridge! Made 100% from silica, a natural resource with high temperature resistance, and 100% recyclable at the end of its life (although the company says you can use them forever). There are no fillers or petroleum-based products in stasher — no BPA, BPS, lead, latex, or phthalates. And the company is a certified B-corporation. Boom. your style says a lot about you. why shouldn't it say something about how much you respect the people and natural resources that went into it? This Denver-based brand focuses on small batch, high quality hats, bags, and candles made from local materials. After the candle burns down, the mold makes a great home for a succulent. The opposite of fast fashion. “A woman should never have to sacrifice style for sustainability. Our choices matter – smart fashion is our future." Fashion is the second most polluting industry in the world, but Amour Vert is proving it doesn't have to be that way. Their products are American made, use only non-toxic dyes, sustainable fabrics, a zero-waste philosophy, and the fabrics are BEAUTIFUL.